The Earth is getting warmer, and while the planet will survive this, many of its inhabitants may not, not if we can’t slow the tons of carbon pouring into our atmosphere. 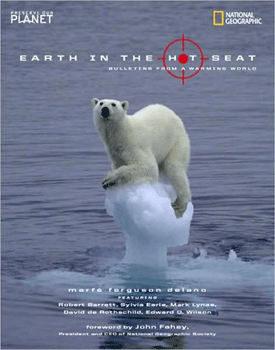 Earth in the Hot Seat clearly explains the phenomenon of and the science behind global warming. It uses real people and real-life examples to report from the front lines of the fight to protect our warming planet. It explores the challenges—and the opportunities—presented by climate change…Most important, it inspires us to care about the planet. It’s the only one we’ve got. Listen to an interview with Marfe on National Geographic Weekend, talking about the book.